In Nov 2013 Dhawal Kulkarni, the Mumbai fast bowler, was close to making his debut against West Indies but within 2 days of his selection, he was ruled out of the ODI series suffering a foot injury. Today, injury to Mohit Sharma gave him the chance to make debut – though an uneventful one considering he took no wicket. “London Bridge Is Falling Down" is a well-known traditional nursery rhyme - the meaning and intention may be uncertain; perhaps ponders over the many difficulties in bridging the river Thames. A medium-sized market town during the medieval period, Birmingham grew to international prominence in the 18th century at the heart of the Midlands Enlightenment and subsequent Industrial Revolution. Today Birmingham is a major international commercial centre. It possesses three universities and two university colleges make it the largest centre of higher education in the United Kingdom outside London. Edgbaston traditionally has a reputation for being one of the most highend, upmarket and/or affluent parts of Birmingham and here lies the famous Edgbaston Cricket Ground, home to Warwickshire County Cricket Club where Indians are to play England in the Third test of the present series. Today at Edgbaston, English team learnt that they are nowhere near where they need to be to win next year's World Cup. At 2-0 down against India - they had nothing going right today too. Dhoni won the toss and put them in. This tour has been disastrous for Shikhar Dhawan, Virat Kohli and Cheteshwar Pujara and for team India in the Tests. Perhaps if Rohit Sharma had not injured himself, Dhawan may not have played today – all that is history - It was over No. 31 - Gurney to Dhawan, crowd braying for blood and a low full toss smacked for a flat 6 – Dhawan finishing unbeaten 97 (may not rue the missed ton) as India remarkably sealed the Series 3-0 winning by 9 wickets and 19.3 overs to spare. A couple of overs earlier at 27.5 Rahane milked Woakes for a couple to fine leg and raised his bat gently celebrating his maiden century in ODIs – a grand match winning effort at that. He had an opening partnership of 183 with Dhawan. The win was Dhoni's 91st victory as India ODI captain, breaking the record of Mohammad Azharuddin. After putting the hosts in, India's seamers did the early damage before spin set the seal on another limp England batting display. England’s conservative approach to one-day batting and their failures against spin is not new, but -symptomatic of a regime that is slow to take risks from top to bottom. They have been paralysed by spin, and not even exceptional spin at that, for years, and unless they find a way to be more positive and take the game to the bowlers they will keeping lagging behind the rest. Today with Bhuvi removing openers and Shami chipping in, they were 24/3 – an unlikely batting display by Mooen Ali brought in for his fifth ODI as England's allrounder in place of Ben Stokes, lifted them to respectability. England folded within full quota and had to bowl a score less. Dhawan has been searching for runs – and this was a golden opportunity that he cashed in. 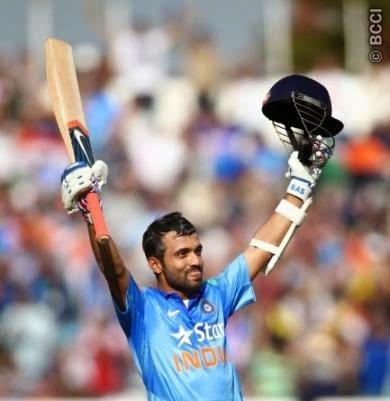 Ajinkya Rahane naturally the Man of the Match. BCCI reports that MRF Pace Foundation has entered into a historic agreement with BCCI – the MOU finalized today includes a tie-up between India’s premier pace foundation and the BCCI for the next five years. The MRF Pace Foundation over the years has contributed to the success of fast bowlers from around the world. The BCCI will send current and upcoming pace bowlers to the academy to train under the Director of the Pace Foundation, the legendary Glenn McGrath. The bowlers will be split into Elite and Probables categories and the training will be imparted in batches. ~ and is that a paradigm shift in a land which once played 5 spinners in a Test in England – the July 1967 test – India did well to dismiss England for 298 and 203……….. match was lost due to a poor batting display in 1st innings (92)- there were quality spinners – Bishan Bedi, Bhagwat Chandrasekhar, Srinivasan Venkatraghavan, Erapalli Prasanna – besides this four - the attack was opened by another spinner V Subramanya who bowled 10 overs and Budhi Kunderan ~ yes, a quality wicket-keeper, who bowled 4 overs……..